When I first moved into my home 4 years ago, the backyard was almost entirely grass. I noticed a little blooming plant in the corner where my backyard met with 3 of the neighboring yards, however. Occasionally, I or my neighbor would nick it with the mower and it would always come back just fine. This morning I was weeding around the patio stones when I came upon a surprise. 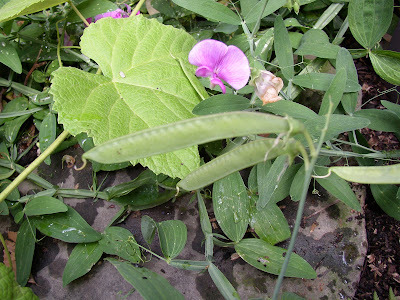 Not only was the sweet pea continuing to bloom, but also it was covered with... peas! A commenter on the Dave's Garden site, in fact, mentioned not liking this plant because its foliage looked like a bunch of preying mantises all strung together... but that's part of what I like about it! 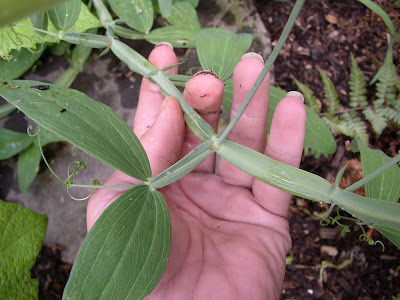 This unique foliage helped me to identify my mystery plant as the perennial sweet pea, lathyrus latifolia. 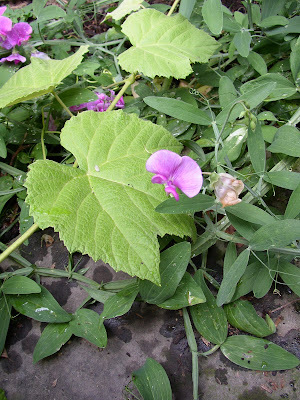 All parts of this plant, including the "peas," are poisonous, and it has been mentioned as being invasive in certain areas as well. So I'm off to cut off the little seedpods now... I'm not going to yank out the plant, but I don't particularly want to enable it to spread around. 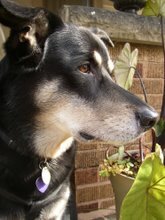 And with a Gardening Assistant who likes to sample the produce in my yard, I really can't have toxic seeds that look like appetizers hanging around within a dog's reach! Surprises like this one are really nice! You're wise to take the seed pods away though, it would be horrible if your dog ate them! I can't believe you've got a blooming Pea plant. It's lovely. I guess it will be dog-safe if you zealously deadhead it. I too have this plant in my garden. If you would like to see a picture of what happens when it gets out of hand go to my blog and look up the post "Oh, what a tangled mess we make" dated july 17. Click on the picture for a closer view. I still like the flowers, though, so I'll be keeping it around for a while. Well, I like the plant but your nails look fabulous! Katarina, it is certainly a very pretty surprise! And yes, I see no reason to tempt the Gardening Assistant. I think she's already got her eye on my first ripening tomatoes, though... lol. Ewa, I didn't realize that they were, either, until I did a little research. Frances, I don't really know. I'll have to check that out--I was kind of surprised to find that these were toxic, to be honest. Mr. McGregor's Daugther, I will definitely have to be zealous about this one. I actually figure that if I catch myself being lax, and/or missing a few pods here and there, I'll simply have to resign myself to cut it out entirely. flydragon, how funny--I can't wait to see your "tangled mess" on your blog! The flowers are so pretty, though, aren't they? oh yes poisonous plants in the garden... I truly freaked out a student as we were harvesting potatoes by mentioning that the leaves were poisonous. She would not go close to the plants and asked a million questions about the dangers, it seemed like a million because there weren't that many different ones in her brain. she was seeking reassurance that she would live another day. It's a great little weed, but keep an eye on it. It will want to take over. Birds love it, and spread it, so getting the seeds early is a good idea. I ended up trying to eradicate the one I brought home. It was popping up in odd places years later. Very pretty though, and worth keeping if you are vigilant. This guy showed up in my garden, thanks for the id! I better check for peas before it lets them lose upon my known garden world! It is a shame, the flower is rather cute! Wow, I didn't know they were poisonous! Thanks for the info. They sure are pretty. Kim, I too like the form of the sweet pea. I hope Coco doesn't think they are peas to eat. Sometimes dogs know things aren't good for them. Sometimes they don't too. Be careful. I think the flowers are pretty enough to keep around, despite the seed poison. I have a couple of these vines, but no blooms yet. I love perennial sweet peas and just posted a picture of them on my blog too--guess we're on the same bloom time. They are also great for fixing nitrogen in your soil.